Whether you’re looking to differentiate your race from previous years or other holiday events, here are 11 ways to put a fresh spin on your fundraiser. Nothing says Thanksgiving day like a slice of apple, or pumpkin, pie. Greet your race participants with a plate of dessert after they cross the finish line as the cherry on top of an excellent event experience. To stock up on post-race goodies, ask for contributions from local grocers or bakeries, or check out what food serving permits you might need to go the do-it-yourself route. Weave elements of great design throughout your race experience to capture and hold participants’ attention. 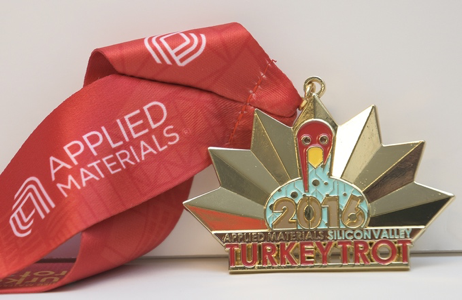 For example, the Applied Materials Silicon Valley Turkey Trot advertises the creative medals they’ll be passing out to finishers this year. You can also create good-looking swag for your event that will help keep your fundraiser top of mind, all year long. Footraces are well known for their “freebies,” such as T-shirts. Align the design of your gear with your event page and marketing materials to ensure a cohesive look and feel. One way to knock your race out of the park is to enable participants to fundraise online. With the right software, you can give each of your registrants their own customizable peer-to-peer fundraising page upon sign-up. Then, they can leverage their personal network to raise money for your cause. To incentivize your community to fundraise, use your registration page to advertise prizes for top fundraisers. Partner with local businesses for holiday-themed prizes like tickets to a holiday concert or outdoor excursion. Get the entire family involved in your event with a “fun run.” This is typically a shorter distance race that takes place after your main event, just for the kiddos. To make each racer feel special, have consolation prizes ready for each child, finisher or not. The Cardiff Kook Run uses a costume contest to generate excitement for their annual 5 and 10K event. Why not make your turkey trot a costume contest? Keep it general, or award a prize for the best-dressed turkey. You might also award a prize for the best group of costumes. 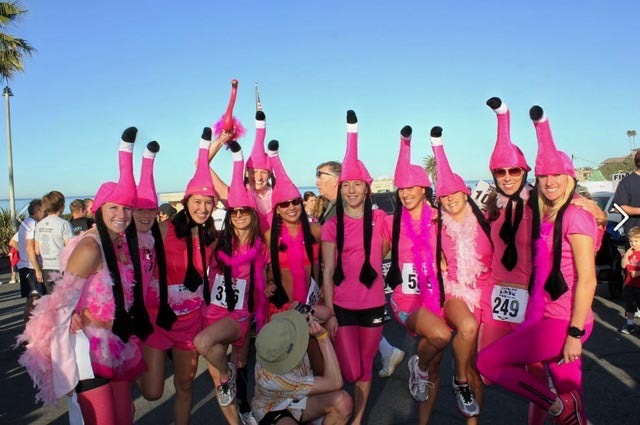 These participants at the Cardiff Kook Run all dressed up as flamingos together. A photographer can create value for your participants by capturing images of their event experience. The photos can also be used to market your event in the years to come. Give participants the option to receive photos taken of them at the race in exchange for an additional donation to your cause. Consider inviting turkey trot participants who could generate hype. Perhaps the mayor would like to speak beforehand and shoot the start gun. Is there a popular local band you could invite to sing the national anthem? “Celebrity” guests can make your event a memorable, next-level experience. Thanksgiving is about the food, so why not host your event the weekend prior and partner with local restaurateurs? Your race could culminate in a food festival that celebrates abundance and the harvest season. Give race registrants automatic entry into the food festival and ask for a contribution from additional guests. A Hash Club is the practiced art of running a 5K and then grabbing a drink with your friends at the local watering hole. These Hash Clubs date back to as early as the 1930s. Take inspiration from this popular club and have your trot end at a tent of local breweries and vendors. The Hot Chocolate 15K is an excellent example of a race that differentiates itself. They stand out from the crowd by offering a post-race gift of hot chocolate, fondue, and other goodies. Serve hot chocolate, or perhaps other holiday-themed drinks such as cider or eggnog to add some cheer to your event. If your organization collects donations in the form of physical items, an event like a 5K could be the perfect opportunity to call for these gifts. The San Diego Run for the Hungry not only raises funds in the form of registrations and donations, they also ask individuals to contribute physical food items and use the day to run a food drive as well. Another example of collecting items is to ask your participants to bundle up on Thanksgiving morning in clothes that they wish to donate. The Chicago Marathon collects all discarded clothing and brings the donations to two local charities. Provide drop off stations throughout the course and ask runners to intentionally overdress and donate their clothes along the way. No matter what angle you choose to make your race stand out, if you keep the focus on the race experience, you will ensure that your participants have a memorable time that encourages them to refer your race to others and participate year after year. Be sure to check out our other free resources as you plan a run for charity to round out your strategy and ensure its success.